In 2014, three key technological forces combined to keep the creative power and business of video rolling. Today, the use of this impressive trio has proved to CEOs, commercial producers and clients alike that video is no longer a luxury but rather a necessity that can be affordable and effective in telling a compelling visual story. As the video production industry heads into 2015, our tech compass is pointing at the GoPro camera, UVAC technology (unmanned video aircraft carrier, or “drones”) and the growing attraction to (and use of) 4K production as drivers of strong growth in video production. The company’s web site (gopro.com) touts that the GoPro enables people “to capture compelling, immersive photo and video content of themselves participating in their favorite activities.” Typically, those activities have been outdoors and involved athletic activities. Bloomberg.com, a financial web site, even noted that by mid 2014 there were 500 million+ views on YouTube of GoPro generated video content. It’s important to note that most often, these are consumer-views. However, if we drill down deeper, filmmakers and Directors of Photography from all over the world along with corporate and commercial video pros are using the GoPro to capture some never before seen shots. Check out www.Vimeo.com for a deep pool of GoPro-created videos. In 2014, we’ve seen feature films like Need for Speed, cable shows like Anthony Bourdain’s Parts Unknown, and corporate video productions for manufacturing, training and marketing. In these productions, the GoPro has become a staple in the producer and videographer’s toolkit. And let’s not forget to mention quality… the GoPro can quite clearly hold it’s own when intercut with high-end production cameras. 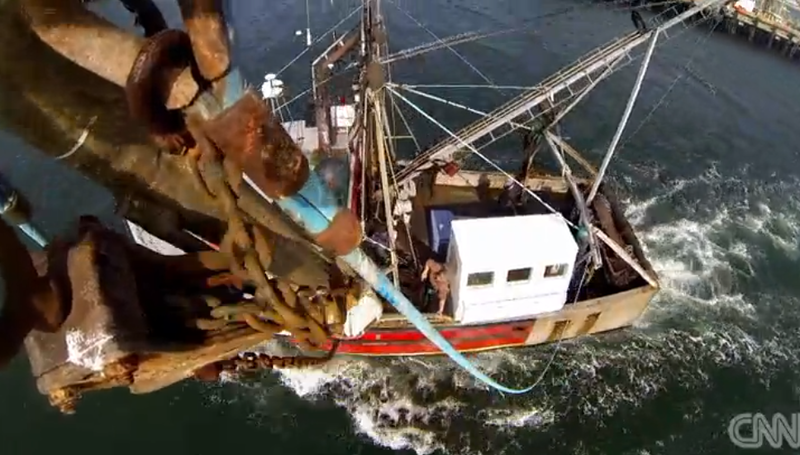 In a recent episode of Bourdain’s Parts Unknown produced by ZeroPointZero Productions, Bourdain and his crew outfitted a fishing boat working the waters of Cape Cod with five GoPro units. The cameras, intercut with the compliment of cinema-styled Sony F5’s and 55’s, captured stunning point-of-view imagery of the boat dipping in and out of seas, high and wide-angle views of the boat’s deck from above and unique perspectives from the Captain’s wheel as the boat headed out into even deeper waters. The GoPro camera is like no other before because it goes where most do not or “cannot” go – on helmets, cycles, torsos, in places the size of a coffee mug, in environments where the air is thin or the water is deep and even strapped on and bouncing on top of animals’ heads. A great example can be found in To Climb An Iceberg, part of the Adventure in Life 4k series www.youtube.com/watch?v=0kBjb1yfabI. The filmmaker’s ventured through dangerous arctic waters in Greenland’s Disko Bay looking for the ultimate iceberg to capture on video and send home. The GoPro’s and their videographers risked their lives and pushed their limits climbing fragile icebergs. Shot 100% on the HERO4® camera, we see one more dramatic example of how and where the GoPro is taking us. How about flight? UVACs (unmanned video aircraft carrier technology) also notoriously known on the streets as the aerial drone, is our second force that keeps video rolling into 2015. UVAC simply means a drone unit is holding or strapped to a GoPro, DSLR or larger camera. Let’s just say this technology has really taken off in 2014 (pun intended). Prior to October 2014, UVAC regulations permitted use only for personal applications or hobbies. Commercial and paid use of UVACs was banned. However, on September 26, 2014, the FAA granted rights to use UVACs in commercial applications to 6 production companies giving certain exemptions and special status specifically for the purpose of aerial (source: Wikipedia). As we head into the new year, we are beginning to see more structured and safer use of UVACs with much needed governmental guidance in the works at the same time. Not only did Grimaldi seem to capture the attention of the world with his now classic “snow flight”, he shot the footage with the help of a GoPro shooting 4K footage. 4K. The third force fueling video’s growth storming into 2015. If you open up almost any television and film production magazine today, you’re bound to see at least one article showcasing 4K resolution cameras and tools. 4K is in. 1080P is fading. In fact, one of the many new podcasts being published for producers, videographers and directors, 4K Shooters, is heralding the new wave of high-resolution 4K production tools and viewing displays. Whether it’s lenses, recording media or cinema-quality digital cameras, 2015 is looking like it will be the year 4k gets a warm embrace. What’s the bottom line for our three powerful video industry drivers? These are tools that help our clients and our projects push the bar higher. With new point-of-view technology like the GoPro and the strong embrace of commercial and industrial applications for the UVAC we’re getting wider and more compelling aerials and ground shots than ever before. Drones are soaring and as long as we’re safely operating them when we’re after the next great shot from above, they’ll continue to be a go-to tool along with 4K production that offers the production pro of today and 2015, more resolution, color and vantages than we could have ever imagined. So, video content lovers and producers alike, brace yourself and hold on tight for an exciting, high-flying, high-resolution year for video production in 2015.